In the other Cullen Cup semi-final, the number two ranked Vancouver Island Raiders (7-3) get the home field advantage as they host the number three ranked Langley Rams (6-4) for a chance to make the Cullen Cup Final. The Raiders concluded their regular season with a 38-9 victory over the Valley Huskers and will look to out-edge the Rams in their upcoming tilt. 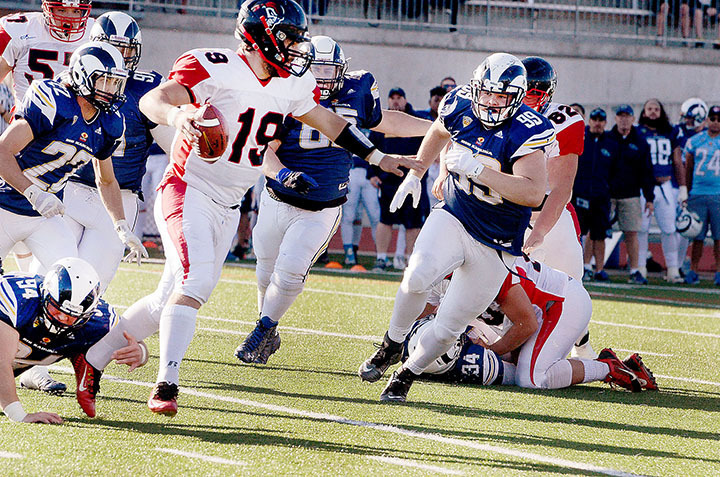 During the regular season, Dexter Shea and Cole Virtanen proved they were the guys to beat on the field after ranking second and third, respectively, in the conference in tackles and receiving BCFC Defensive All-Star honours. Shea finished the season with 38 tackles, two knockdowns, two sacks, two forced fumbles and a fumble recovery, while Virtanen finished with 31 tackles, six knockdowns, one forced fumble, and five picks. On offence, look for quarterback Liam O’Brien to lead the team after completing 128-of-204 passes for 2089 yards and 20 touchdowns during the regular season, with Dustin Rodriguez and Arthur Fabbro as his favourite targets. The Rams are also coming into the semi-final on a high note after a 35-23 win over the Westshore Rebels and look to claim their first victory over the Raiders this season. The Rams had several BCFC all-stars this season, including Brock Gowanlock (17 tackles, 5 assists, 13.5 sacks, 1 knockdown, 1 fumble recovery for a touchdown, 2 forced fumbles) and Alex Agnoletto (30 tackles, 11 assists, 4 sacks, 1 interception). On offence, Nathan Lund also racked up BCFC Offensive All-Star honours after finishing second in the conference with 74 carries for 621 yards and five touchdowns to wrap up the season. On special teams, look for kickoff return specialist and defensive back John Beckerleg to do some work after ranking first in the league in kickoff returns with 14 returns for 456 yards, averaging 32.6 yards per return. On defence, Beckerleg also received All-Star honours for the second consecutive year after amassing 16 tackles, 4 assists, 1 knockdown, 1 forced fumble, 2 fumble recoveries, and 1 interception during the season. In their two meetings this season, the VI Raiders swept the series by a combined score of 46-32. Can the Rams prove that they’re a different team, or will the Raiders punch a ticket to the Cullen Cup Final? Tune in this week to find out!